In order to get something you’ve never had, you have to do something you’ve never done! If there is something you want in life just wishing it was so isn’t enough. 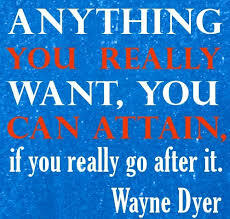 You have to take action and do the work to attain it no matter how daunting things may seem at times. Keep the faith, it’s usually the moment you decide to give up is right before the moment your dreams are to become a reality. 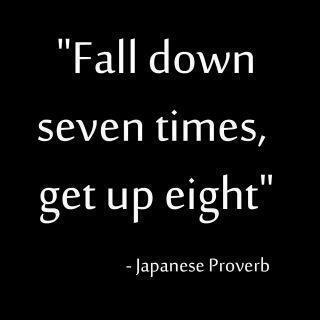 I know at times getting knocked down can be really discouraging but those are the times when you are truly being tested. It is the time when your determination must be greater than your doubt, your passion too strong to allow for any other outcome. Anything worth having, anything placed in your soul and your heart is worth fighting for even in the face of challenge. Encouragement or discouragement can be the breaking point if you let it especially when time and patience are a requirement for your dream. Don’t ever let anyone tell you what is not possible for you! If you have a goal, a dream and you feel that when you share it with others they try to derail your plans and say it’s impossible then the solution is simple, only share your dreams with those who love and support your vision. You need people around who motivate you not to give up, who remind you that you can do it, who dive into your vision with you and experience the glory of imagination and dream. It doesn’t matter if you or anyone else may think on some level of “reality” that what you want is a pipe dream because I can assure you nothing is impossible for you! The only time it becomes impossible is when you start to believe the naysayers, when you let the seeds of doubt creep in. As long as you have passion to chase it with everything in you then impossible turns into I’m possible. The world has become abundant with “instant gratification” in so many ways which has both good and bad sides to it. I guess the upside is that you get something you want right away and you don’t have to wait but then how much do you value it, does it become a prized possession? Likely not because prized possessions are usually something that you put blood, sweat and tears into which is why you cherish them. So then the downside would be that you don’t appreciate what you’ve attained because it was too easy to get. 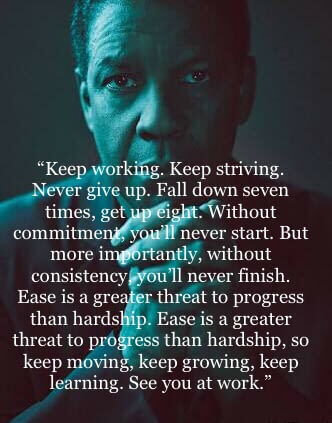 When you really have to work hard and wait for a dream to manifest you have no choice but to build your patience, for those of you that struggle with patience, like me, that is a task in itself. When you do start to see things come to fruition it builds so much more; self-worth, self-esteem, pride, confidence, belief in yourself, inner strength and the list goes on. When you’ve reached a goal or dream you tend to want to hold onto it more and not let it go, not gripping too tightly but in a treasured kind of way. It becomes your personal badge of honor on your soul, not for others to be impressed by you but for you to feel proud of the commitment you nurtured into your reality. If you feel there is something more you desire and you want more passion and purpose in your life start with where your heart goes when you let your mind wander. The solutions lie within the stillness of your mind, in the quiet moments you hear the answers to your most pertinent questions. You were not born to live a mediocre life, you are destined to live your best life! Find your passion and it will lead you to your purpose! At the end of the day you have to ask yourself, have I done all that I need to go in the direction I seek? You get out of life what you put into it, nobody is going to get their dreams served to them on a platter, if you want it, you have to put in the effort. In order to live the life you dream of having you have to take the steps and by steps I don’t mean just saying it out loud, your actions are needed to reinforce the dream. You can’t just sit back and think to yourself “well I stated my intentions, I’ve done my part” but if that were enough then why is everyone else working so hard to achieve their goals? It’s because that’s what you have to do, anything worth having is definitely worth working for! This applies to all aspects of life, not just your career, any area that you want to manifest abundance in requires your vested interest. When you understand that abundance in any area of your life exists because you’ve tuned into it, made room for it and welcomed it in then you will find that same abundant life continues to grow and becomes more and more abundant. You cannot be tuned into abundance without having the basis of gratitude energetically operating in your state of being and it is through gratitude that abundance is cultivated. A positive mindset is the key to any manifestation in life that you desire and “oh the places you will go” when you believe and see how it works, sometimes it can even seem surreal. If you are not there it’s not because there are too many obstacles in your way, it’s because you’ve made room for there to be obstacles and you’ve told yourself that they are too big for you to get around. The only reason life goes in a negative direction is because your mindset is also feeling negative, like attracts like. If you feel you don’t deserve to be happy, the “Law of Attraction” responds and gives you more of what you’re thinking “I don’t deserve to be happy”, maybe time to change that tape for the positive! You have to get out of your own way to allow good things to happen for you, you can’t allow any negative thoughts to impede you from your goal. If the negative finds an opening it will try to sift its way into your thoughts, recognizing and evicting it in that moment is your defense, use it well and a lot if you have to. Too many times we allow others to define us but we are not defined by them or their thoughts, we are defined by our words and subsequent actions or inactions. How or what someone else feels or says about you doesn’t define who you are, it defines who they are and is very good insight into how they feel about themselves. You have your own personal power at your disposal at any time to help you attain your dreams, think of it like global warming but instead it’s known as universal power and unlike global warming it’s a positive thing that we all have the ability to tap into. Once you are “in the zone” there isn’t anything you can’t achieve. I’m sure you’ve had one of those days where “you know, you rock” and get everything that you wanted done and then some, days like these provide us with our own personal rewards of achievement for doing well and you should be proud of yourself. It is that wave length that lets you know you are plugged in so take advantage of those days when they happen, use them to tackle fears you might not otherwise do on an off day because once you find the way to build on that momentum you will find that momentum comes along a lot more often. When you think, believe and see what you want as the outcome, there is no room for any other outcome other than that which you see and no other outcome will occur. When you allow and make room for what you see and feed it with positive thoughts the “Law of Attraction” responds and gives you more of what you’re thinking “I will see what I believe will occur”!